Jawsh Smyth works on Melting Man, located on La Tijera Blvd. at Sepulveda Westway. 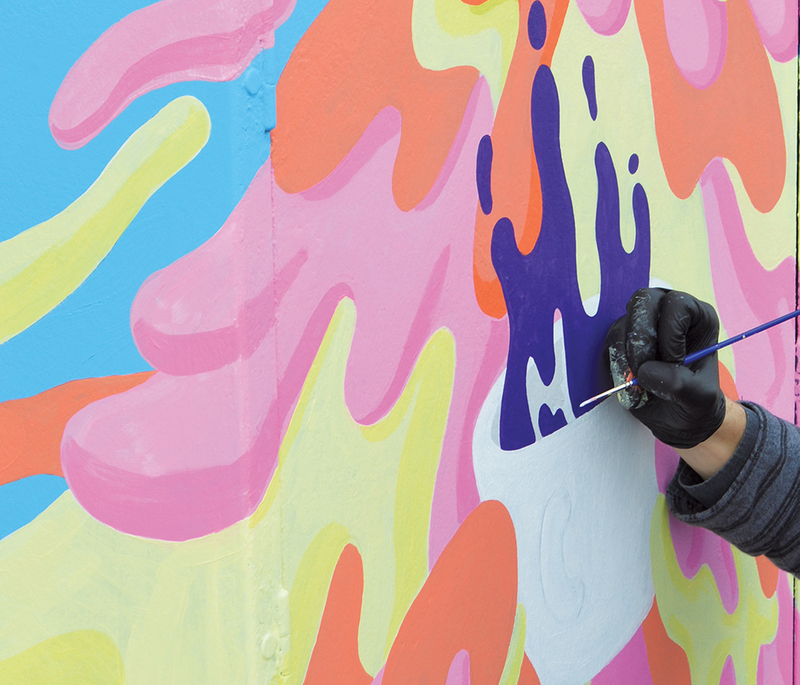 Colorful mini-murals on utility boxes are popping up all over the neighborhood, thanks to talented artists who are helping bring more public art to the community and beautifying some of the area’s busiest thoroughfares. 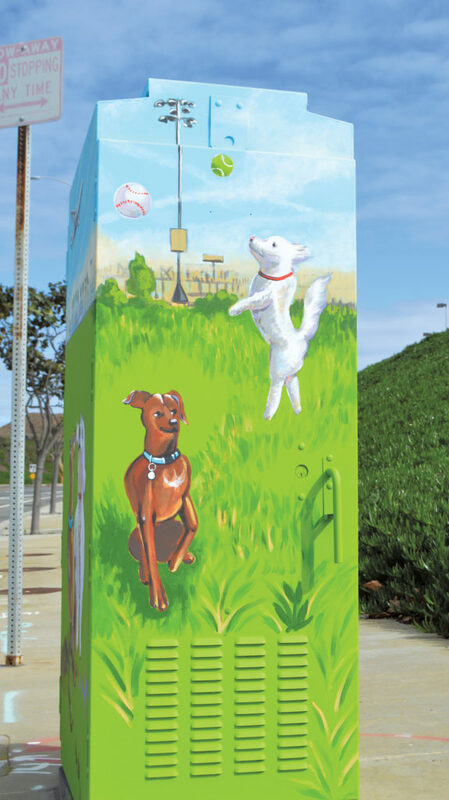 Noticing that other areas in L.A. had artwork on their utility boxes, NCWP President Cyndi Hench thought bringing the program to Westchester/Playa would help transform the drab, gray boxes into cool, colorful additions to the neighborhood’s streetscapes. She connected with the newly formed Westchester/Playa Arts Committee for support on the project and a call for artists was put out early last year. The committee, which is made up of local residents, business leaders, community group representatives and artists, was delighted by the proposals they received. With funding from the Neighborhood Council of Westchester/Playa (NCWP), Councilmember Mike Bonin’s office and the Drollinger Family Charitable Foundation (DFCF), with support from the Playa Venice Sunrise Rotary Club, 11 designs were selected and approved by the committee, the NCWP and the city. Artists began painting in mid-January, and all of the boxes are anticipated to be completed by March. The Westchester/Playa Arts Committee is looking to secure additional funding and hopes to announce the next call for utility box artists in the spring. If you’re interested on being on the email list for upcoming utility box mural opportunities, please email westchesterplayaart@gmail.com. Playa Vista artist, Jawsh Smyth, works as a graphic designer but in recent years has taken more of an interest in the fine arts. His colorful, surreal and playful design depicts his alter-ego, Melting Man. Smyth is also the artist behind the 16-foot mural, “Oaxacan Dancer,” located at Westchester’s Cinco. Check out Smyth’s utility box located on La Tijera Blvd. at Sepulveda Westway in Westchester. Steve O’Loughlin has been a professional artist for more than 25 years and has been creating public art for more than 15. A Westchester resident since the early 90s, O’Loughlin’s goal is to use his artistic skills to translate and express the spirit of the community. 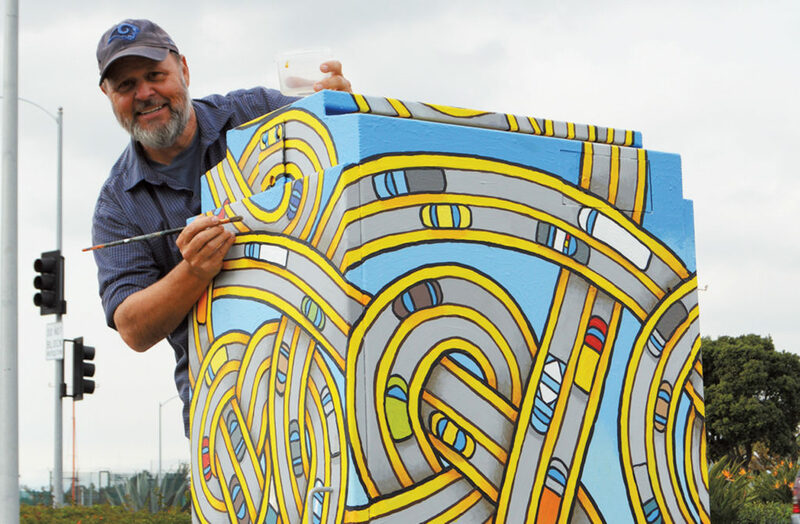 His utility box painting, which uses his signature knotwork patterns, is an homage to traffic as it flows smoothly and gets us safely to our destination. O’Loughlin has murals and artwork all over Westchester, including at Covenant Preschool, Holy Nativity Church, Wright Middle School and at numerous elementary schools. Check out O’Loughlin’s artwork on the box located on Sepulveda Blvd. at Sepulveda Eastway in Westchester. A toy designer by day, artist Valerie Gresham loves to draw and paint in her spare time, especially when it comes to sketching her dog, Sparky. Gresham used Sparky, a Miniature Pinscher and his friend, Luna, as inspiration for her playful design that depicts the two playing in a local park while planes soar in the background. Check out Gresham’s design on the box located on Westchester Pkwy. at Pershing Dr. in Playa del Rey. Four local artists showed off their skills to complete a box in Playa del Rey showcasing the Ballona Wetlands. 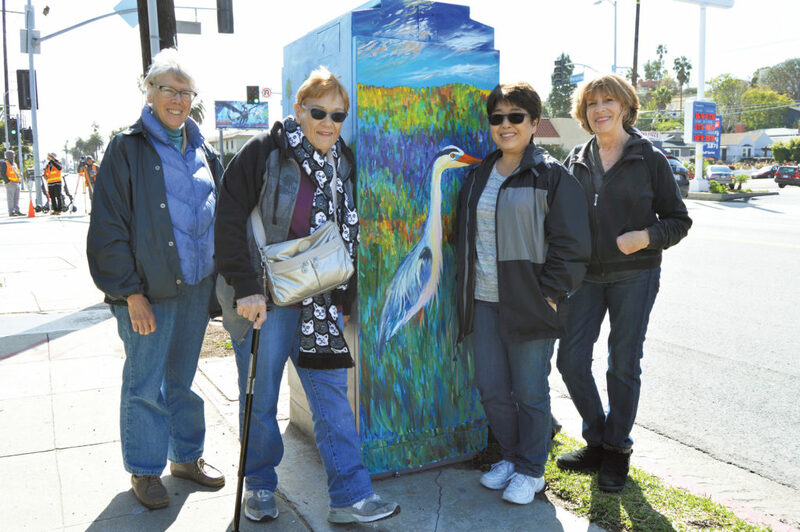 Artists Gloria D. Lee, Leslie Lauerbach-Davis, Karen Taka and Marion Wong are all members of the Westchester Senior Center Art Class and were the only group submission for this first round of utility box murals. 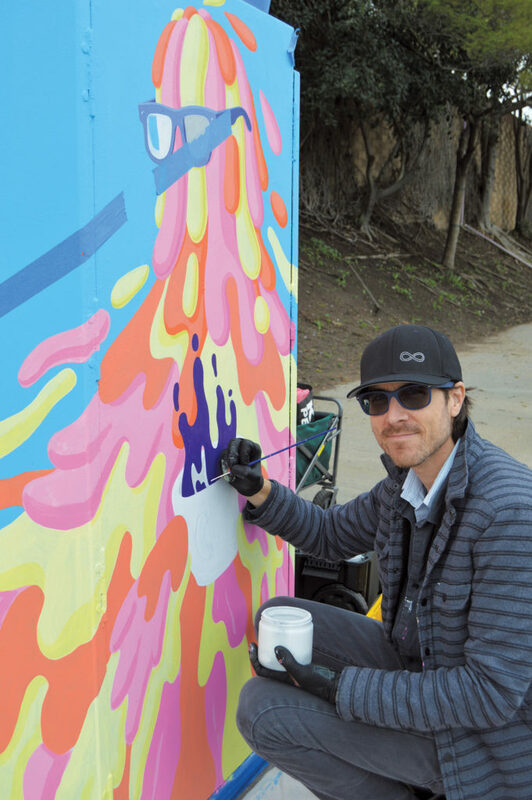 Lee has been teaching art classes in Westchester for more than 20 years, and the painters who submitted the design thought participating in the utility box mural project would be a great opportunity to give back to the community through art. Check out the box, located on Pershing Dr. at Manchester Ave. in Playa del Rey, for scenes of the flora and fauna that help make up the Ballona Wetlands and the bike path.